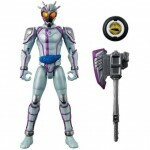 TK10 Kamen Rider Chaser is due for a May 16h Release for 3456 yen. 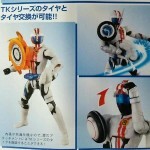 Included with Chaser is his Signal Axe as well as the Kikern Signal for use with TK Kamen Rider Mach! Sadly Chaser does not include his Break Gunner meaning you’ll need to borrow one from your Mashin Chaser for him to use. The second Premium Bandai release for the Tire Koukan line is revealed in full! 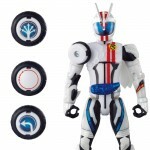 This set features the 3 tires exclusive to Kamen Rider Drive’s newest form Type Formula. Consisting of the Mantan, Spanner, & Jack Tires is the TKPB02 Formula Tire Set! 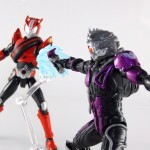 Several new images have been posted online detailing two upcoming Kamen Rider Drive releases. *First up, TK-09– the action figure incarnation of Type Formula! This figure is an excellent recreation of Drive’s next upgrade, and should be fully compatible with other Tire Koukan releases. TK-09 is scheduled for release in March at a price point of 3500 Yen. *Next, the DX Trailer Cannon– the signature weapon of Type Formula! This cannon uses Shift Cars for ammunition and is sold with the Shift Formula Shift Car. The Trailer cannon is also set for a March release and will cost 5800 Yen. The 8th entry in the Tire Koukan action figure series has been released! Youtube reviewer wotakufighter offers an in-depth look at this interesting new figure. Type Dead Heat is a unique power-up form shared by Kamen Rider Drive and Kamen Rider Mach. Because of this, TK-08 pulls double-duty and can change into both Rider forms! 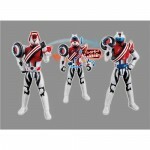 This figure is available from all preferred retailers for 3456 Yen before shipping and handling. The next entry in the Tire Koukan line has just been revealed and TK-08 puts a new twist on the line! Rather than just being one figure, TK-08 is 2-in-1! TK-08 is both Kamen Rider Drive Type Dead Heat AND Mach Type Dead Heat! 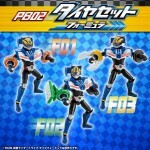 By way of a rotating tire, belt, and helmet this figure can assume the form of either rider! It’s a tiny image but for the moment this is our first look at how this figure will function. Stay tuned as more information and release details become available. Drive: Type Fruits! On Stage! Kamen Rider Drive is knocking it out of the park again with another release in it’s Tire Koukan toy line, TK-SP Kamen Rider Drive Type Fruits! This form, based on Kamen Rider Gaim’s trademark Orange Arms & exclusive to the Drive X Gaim Full Throttle movie, takes the asymmetry of Drive’s base Type Speed and mixes it up with some very interesting samurai armor. The Type Fruits Tire included creates some new hip & shoulder armor & a kasa style hat completes the samurai look. But as a a true Gaim homage it isn’t complete without a Daidaimaru & Musou Saber for Drive to wield! As far as movie exclusive forms go, this one is definitely one of the more interesting. And once again, our favorite youtube reviewer Baltmatrix has also contributed a video review of Drive Type Fruits. Check out the full video below! After the jump we’ve assembled over 70 images of this fruitastic figure! So be sure to check them out and read on for a full review and breakdown of this figures features! Baltmatrix and I wil return soon with another one-teo punch of Drive action with the DX Ride Crosser & TK-07 Kamen Rider Mach! This dark anti-hero and former Kamen Rider from Kamen Rider Drive finally joins the Tire Koukan toy line! Today we’re looking at TK-06 Mashin Chaser! So far the only villain in the Tire Koukan line, Mashin Chaser takes the gimmick and twists it just a little bit. As in the show Chaser’s Tire Koukan attachment point is on his back, meaning jsut about any tire you want to attach to him won’t interfere with how this figure functions. Mashin Chaser comes with his trusty Break Gunner but also includes his very own version of the gimmick in the form of the E-Circular multi-weapon! It even includes attachments to form his 3 signature Viral Core upgrades: Tail Whipper, Wing Sniper, & Fang Spidey! If those features aren’t enough to convince then perhaps a video review by my friend and frequent contributor Baltmatrix will! As always we’ve tried to team-up and tackle this figure on both review fronts. Be sure to click the link at the bottom of this post to be taken to a gallery featuring over 60 images of TK-06 Mashin Chaser including every Tire Koukan combo possible with it! Official images for the 7th release in Kamen Rider Drive’s Tire Koukan line have been released! TK-07 Kamen rider Mach is set for release on January 17th for 3200 yen. Mach includes his signature sidearm the Zenrin Shooter, the default Advent Signal, Advent Signal Magarl, & Advent Signal Kaksarn. 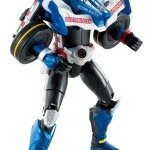 Mach is also capable of using Drive’s Tires in place of his Advent Signals. The DX Ride Macher will be released on January 29th for 5000 yen. It will include the Tomare Advent Signal and feature the ability to combine with Machine Chaser’s Ride Chaser to form the Ride Crosser. After this week’s episode of Kamen Rider Drive and his flashy first appearance, Kamen Rider Mach is about to make his debut in the Tire Koukan toy line as well! We’ve just come across our first actual image of the figure. Mach will be released as TK-07, and this image confirms some initial thoughts about the figure. First we can see that Mach’s V-Helm is entirely functional and reveals his Shutter Guard faceplate just as it does in show. He will at least include the Zenrin Shooter, the default Advent Signal, and the alternate Advent Signal Magarl as well. Being that this is where the connection point on Mach is, we can also see that Kamen Rider Drive’s tires are fully interchangeable with Mach! TK-07 Kamen Rider Mach will be released in January and retails for 3200 yen! TK-05 Kamen Rider Drive Type Technic Gallery & Review – Toku Toy Box Entry! TokuNation has filled up with some high octane Kamen Rider Drive action for your viewing pleasure! Today we’re taking a looking at the 5th entry in the Tire Koukan toy line, the master of machines himself, TK-05 Kamen Rider Drive Type Technic! Type Technic is a unique form. Rather than offering raw power to Drive it gives him highly technical skills like machine manipulation, increased dexterity, and near perfect accuracy. What the Tire Koukan figure of Technic gives us is another incredible addition to this growing line. Included with Technic are the standard Type Technic Tire you need to complete his basic look, the Fire Braver Tire, and Drive’s Door Gun! As far as complete packages go, Type Technic is yet another one in this line. This figure differs just a bit from previous Tire Koukan releases and we welcome you to read our review to find out how. Or why not take a few minutes to check out a video review of TK-05 by my frequent collaborator Baltmatrix! Check out the above video as well as 65 images of this great figure after the jump by clicking “Discuss on the TokuNation Forums” at the bottom of this post. 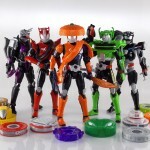 And don’t forget to leave a comment in that thread as well, it’ll enter you into our massive Toku Toy Box Giveaway! Specifically this gallery thread enters you in for a chance to win our Top Gear Rider Legends Prize Pack! If you need a refresher on the rules and prize packs then check them out here, and good luck!